If you missed Caryl Churchill’s Escaped Alone at BAM in February, more’s the pity. But you now have a chance, at least, to see a play that is in many ways its sister. 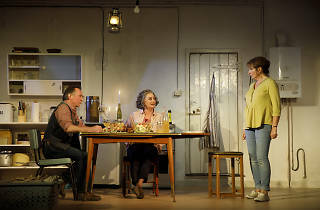 Like Churchill’s show, Lucy Kirkwood’s unsettling and provocative The Children played at London’s Royal Court Theatre in 2016; they share the same director (James Macdonald) and set designer (Miriam Buether) and have a cast member in common (the superb Deborah Findlay), and they both include British senior citizens bonding over a nostalgic musical number (in this case, line dancing to a James Brown song). And, oh: Both plays are about the apocalypse as it might happen now. Whereas Churchill’s vision of destruction was described in outlandish literary fantasy, however, the disaster in The Children is more literal. In the aftermath of a nuclear meltdown at the power plant they helped build, retired engineers Hazel (Findlay) and Robin (the sprightly Ron Cook) have abandoned their home for a simple seaside cottage outside the contamination zone. (Buether’s raked set places everything askew, as though just on the verge of sliding off a cliff.) There they receive an unexpected visit from the statuesque Rose (Francesca Annis), a former colleague with a plan that would upend their futures. Hazel is correctly wary of her motives—Rose was a rival for Robin’s affections way back when and remains a disruptive force—but Kirkwood keeps the angles of their romantic triangle secondary to a larger concern: the mess that baby boomers have made of the world and what they can do to clean it up. As Rose, ever the femme fataliste, says: “We can’t have everything we want just because we want it.” Behind the subtleties of its direction and acting, The Children’s central question is blunt: What does it mean to be responsible? Samuel J. Friedman Theatre (Broadway). By Lucy Kirkwood. Directed by James Macdonald. With Francesca Annis, Ron Cook, Deborah Findlay. Running time: 1hr 45mins. No intermission. Through Feb 4. 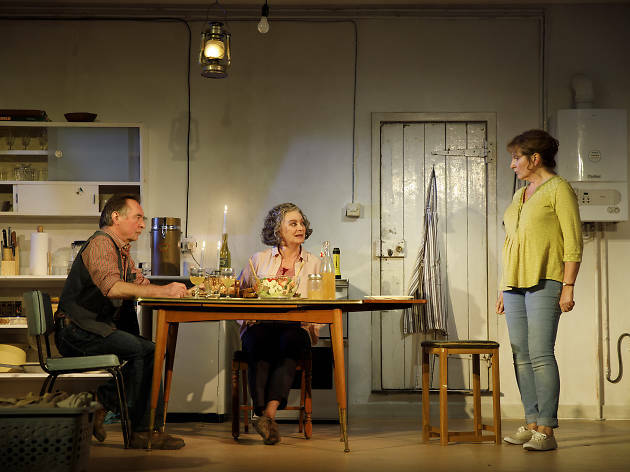 Riverting, haunting, and funny all in one, The Children has a minimal production and a cast of three but that sets the stage for commanding performances about a cautious tale of how the sins of the past can affect the future. What's great about this play is how it doesn't spoon feed the audience in telling the story. The story is told spectacularly through the dialogue and the audience is taken on what has happened and what will happen. The nuclear power station has had an explosion. Happy viewing and remember: Don't deny, satisfy!